Unorthodox hues are a trend du jour for the coming wedding season. Think beyond traditional tones of red and opt for hues which were not a part of the regular bridal trend wheel. From deep blues, turquoise, canary yellows to coffee, Indian designers have opened doors to colourways suiting every kind of bride. While Sabyasachi has created an array of gold on gold ensembles, Anita Dongre continues her love affair with dark greens and blues. In case you are on a lookout a breezy Mehendi look, Anushree Reddy’s lime green and hot pink lehengas might fit the bill. Here is our edit of some of the coolest lehenga colours for a spring-summer bride. Tones of blue are a great option for a summer bride. This powder blue tissue lehenga by Anita Dongre with embroidered peach accents fits the bill. In case you are looking for a perfect day look, here is your cue. If you are too intimidated to pick up an all-white ensemble, cream with an infusion of gold gotta work and embroideries can help. This Sabyasachi lehenga in Khadi encapsulates tradition and modernity, effortlessly. When it comes to experimenting with striking hues, Anushree Reddy aces the game. 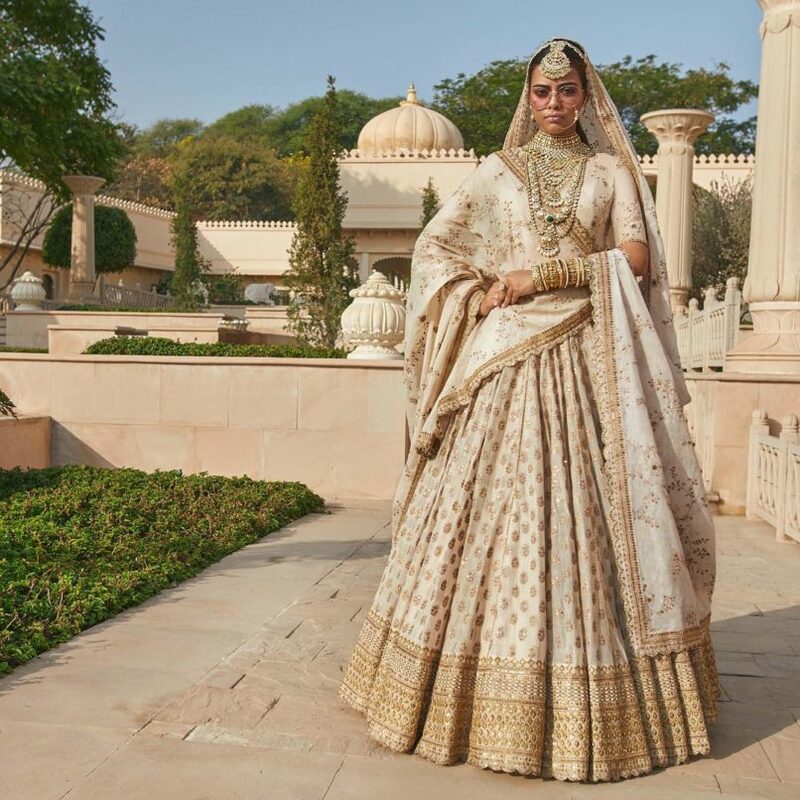 With Bollywood celebrities such as Kangana Ranaut and Malaika Arora Khan wearing her lehengas, she is making headway to becoming one of Bollywood’s prefered bridal designers. Looking at her past trajectory of work, she has always looped in unconventional bridal hues but this green lehenga with a lighter green dupatta seals the deal. Perfect for your sangeet and other ceremonies leading up to your wedding, yellow is considered an auspicious colour. We suggest pairing it with hints of other hues. This mango yellow barfi jaal lehenga paired with a feroze silk blouse and a hot pink boota dupatta is perfect for the occasion. In case you are on a look for a hue which is traditional yet contemporary, maybe tones of wine can help. Not distant from red, this colour is perfect for a reception look. This wine lehenga with exquisite work of zardosi with a toned-down dupatta works wonders. Purple is no longer a fall colour. It’s moved across to the Spring-Summer side and is a royal hue that is perfect for brides who like dark shades. Try to keep it monotone for added glamour and a hint of sensuousness. Coral and peach are two hues that spring brides will never get tired of. This sheer beauty by Abhinav Mishra is a welcome change in a sea of pinks and blushes. It’s such a great way to wear gold or silver, these muted highlights in the lehenga provide you with a glamorous look while staying on the traditional side of things. And the muted metallic vibe takes you from morning to night effortlessly. Trust Raw Mango to reinvent the lehenga game with one in black. Be it with heavy embellishments or gotta work, lehengas in black are having a moment. This Raw Mango lehenga skirt in pitch black paired with a black dupatta conjures up a fine look for a wedding. Acid tones are already seen in Sabyasachi’s collection and now bridal favourite designer, Dolly J is using lime yellow to make the embroideries pop. Kresha Bajaj knows just what globe-trotting brides like – a hint of tradition and a whole lot of fashion. That explains why this grey gunmetal lehenga scores high on our summer shopping list. Take it from us, grey is the next big spring trend. Want exclusive Wedding tips, ideas and features? We have it all. Sign up to get the latest from Lifestyle Asia India.